A trend that we love to see is custom floating shelves. There are so many potential uses and spaces for floating shelves in your house. That's why we’re going to break it down and give you some great ideas! Whether your goal is to add storage space or add your unique sense of style, we want to create floating shelves that work for you. We’ve compiled a list of areas in your home and the potential uses… let’s dive in! Bathroom: You can have extra toiletries or towels on your custom floating shelves. Plus, the ladies can have extra room to store their makeup for easy access. 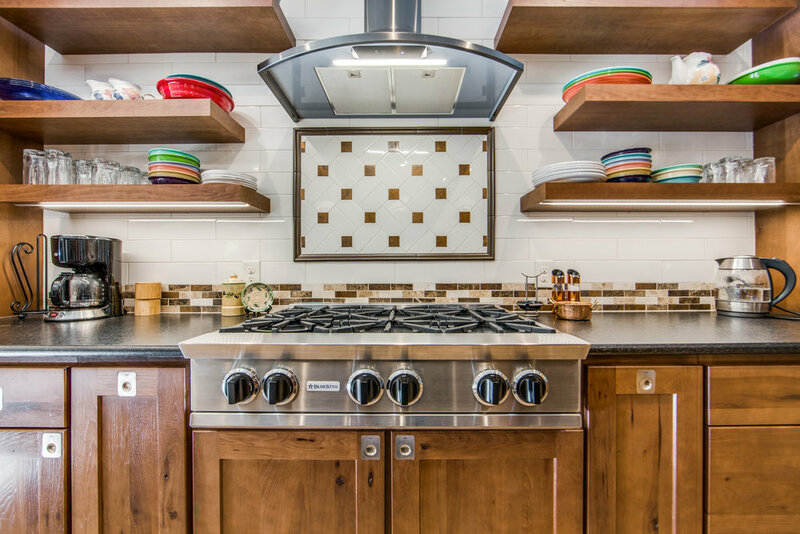 Kitchen: You can display your best dishes on floating shelves. You can also choose a color that will blend in with your current kitchen or select an accent color to make it a central point of the kitchen that pops with color. Laundry Room: I don’t think anyone will disagree that we all need more space in the laundry room. Floating shelves will give that illusion where you can place detergent or leave a floating shelf always clear to put folded laundry on while tackling several loads. Hallway: if you have an empty hallway space you can put in floating shelves as a sort of accent wall! Decorate it with whatever you like, and you can make it more unique than just a picture hanging on a wall. Above TV: this can be an excellent place for your Blu-Ray player or even stack up board games or a couple of great books that you’ll pick off the shelf when there’s nothing on TV. Bedroom: Whether you want floating shelves in your kids' room or your own it is a perfect place to store books, trinkets, or jewelry. Garage: This is another area in your home where you need to maximize your space. Using the walls in your garage can help you sort and quickly see where you placed everything whether it be your toolbox or seasonal decorations. Closet: Floating shelves can be used for purses, shoes, clothes, and accessories! Regardless of the space you choose to put floating shelves in, KM BUILDERS will install something that you will love! If you have any remodeling projects in mind call us up at 210-680-5626 for a free consultation to talk about an upcoming dream home project!